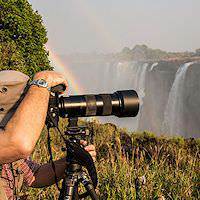 Tips that both amateur and professional photographers may find useful when traveling to Southern Africa. 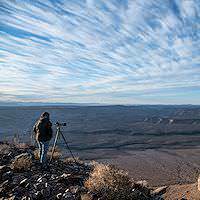 Generally, travelers and photographers will fall into three broad categories: beginner or casual, intermediate, and expert or professional. Regardless of your level of photographic experience, if you intend to travel with a camera, it’s always a good idea to understand how it works. We also suggest traveling with your camera’s handbook, as undoubtedly at some point you’ll want to take advantage of a feature you know your camera has which you cannot remember how to activate. 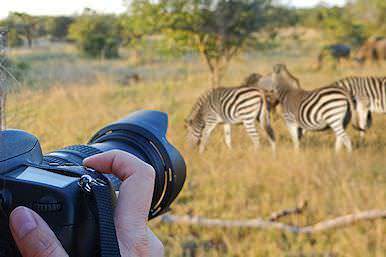 If desired, African Sky will be happy to arrange the rental of photography gear for the duration of your safari. We’ll deliver the gear to you on arrival and will return it after completion of your safari. Please ask for further details and prices. Paragraphs one and two below will cover camera info in general, while paragraph three will also cover detailed information about wildlife photography, a lot of which is applicable no matter the type of camera you carry. If you own a camera, whether an ‘old’ film camera, a point-and-shoot or a DSLR, and are not concerned with capturing topnotch images but rather wish to record your travels for the sake of reminiscing, then any camera will do the job. Make sure you bring enough memory/film and batteries and don’t forget your charger. Make sure that you’re aware of the local voltage supply. If you’re one of those folks who’s moved up from the point-and-shoot category and has purchased a DSLR, then you’ve opened yourself up to many new and exciting possibilities. You’ll have access to the latest technology continually filtering down to the consumer and pro-sumer range. In particular, your camera will be compatible with your manufacturer’s top-end lenses (better glass always produces better images), as well as features like continuous shooting of up to 8 frames per second (fps), and better control over aspects like ISO, aperture, and shutter speed. Understanding these three aspects and how they work together will equip you with the knowledge required to produce better quality images, and as your skills improve you’ll find that you’ll use the ‘full auto’ modes less often, in favor of the manual modes which allow better control over one or more of these aspects. Aside from the above, most folks in this category will have very specific reasons why they choose to travel. For example, they may book a stay at a specific safari lodge where big cat sightings are excellent, and will bring along the necessary equipment to capture great magazine-quality images. The reality is that this can easily become a very costly enterprise, with most safari lodges willing to provide - at an extra cost – a dedicated game drive vehicle with ranger and tracker for full day photographic excursions. The wildlife In Southern Africa’s large wilderness reserves has been habituated to the presence of vehicles over many decades. The result is that lenses up to 300mm will work just fine for most scenarios. Please remember, though, that these are wild animals, and they do not pose for photographs. Understanding your camera inside and out as well as exercising patience will always pay dividends. Since various reserves are wooded to a greater or lesser extent, it should be remembered that no-one can guarantee sightings. Weather and seasons, as well as various other factors such as available food and such, influence wildlife movements and whether they choose to be seen or not. A minimum focal length of 200mm is recommended. A 300mm lens is ideal and not too cumbersome. Canon produces a very versatile 100-400mm lens which will do a great job. Both prime (fixed focal length) and zoom lenses are ideal, and the higher the quality the better. Professional series lenses can produce professional quality images. My personal kit consists of a Canon 1D MK IV along with a 70-200mm f2.8, a 300mm f2.8 prime, a 1.4 converter, a 16-35mm for wide angle shots, a dedicated flash unit, and all the additional associated peripherals such as extra batteries and memory. Most safari lodges (all in South Africa) will provide electricity for charging of batteries. I personally do not carry a tripod or monopod as neither is practical for use in a vehicle. What you will need is a decent bean bag while photographing from the vehicle. When I fly, I usually empty my bean bag contents into a container which I leave at home, then fold up the bag and carry it in my luggage. When I arrive at my destination I buy a couple of packets of rice and fill the bag with it. I also suggest a hand-held blower and good cleaning equipment as it can be dusty and you’ll want to keep your kit clean. In my opinion a decent, powerful flash for wildlife photography is essential equipment, and I use my 580 EXII with a radio (not infrared) trigger to eliminate nasty eye-shine, especially with the big cats, as well as for photographing in shadow or on cloudy days. For the 70-200mm I also carry a polarizing filter for those bright sunlight shots, in order to cut out reflection and darken the sky a little. Finally, I suggest making a list of the serial numbers of all the equipment you bring along. Almost certainly no-one will pay your camera bag any attention, but on the off chance that customs asks you to complete an import form requiring the serial numbers of your equipment, then you’ll be prepared. While you’re at it, add your iPad or laptop to the list too. 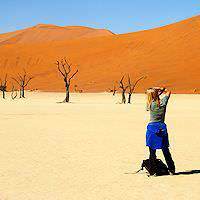 South Africa's most popular travel destinations are Kruger Park & Cape Town. Botswana safaris often include exciting water-based safari pursuits. 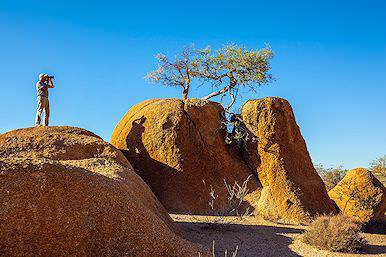 Namibia is best known for its awe-inspiring desert landscapes. Zambia's finest safari areas are South Luangwa and Kafue National Park. 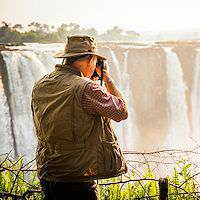 Travel to Zimbabwe for a dramatic perspective of the Victoria Falls. Mozambique is a tropical paradise rich with natural beauty.